The Al-Shabaab terror group made headlines last month with its horrific massacre at the Westgate shopping mall in Nairobi, Kenya. However, Al-Shabaab has been terrorizing innocent civilians for over a decade. Try as they might, Al-Shabaab cannot break the spirit of all their victims. A mighty spirit is a powerful foe to those with evil intentions. 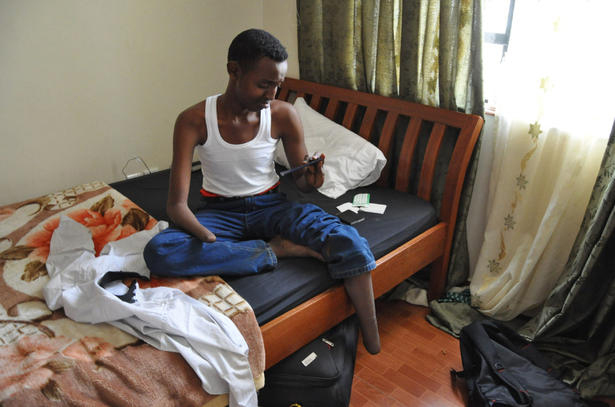 One such mighty spirit is Ismail Khalif Abdulle, a young Somali who was a teenager when Al-Shabaab maimed him. In 2011, to escape the fear he lived with back at home, he moved to Harstad, Norway, 125 miles north of the Arctic Circle. There, he had a clean, comfortable place to live, food to eat, access to the medical care he needs, and a chance to make a life for himself. The climate and social atmosphere of his new home in Norway were about as different as you could get from the home he left in Mogadishu, Somalia—which is about the same distance north of the Equator as Harstad is north of the Artic Circle. 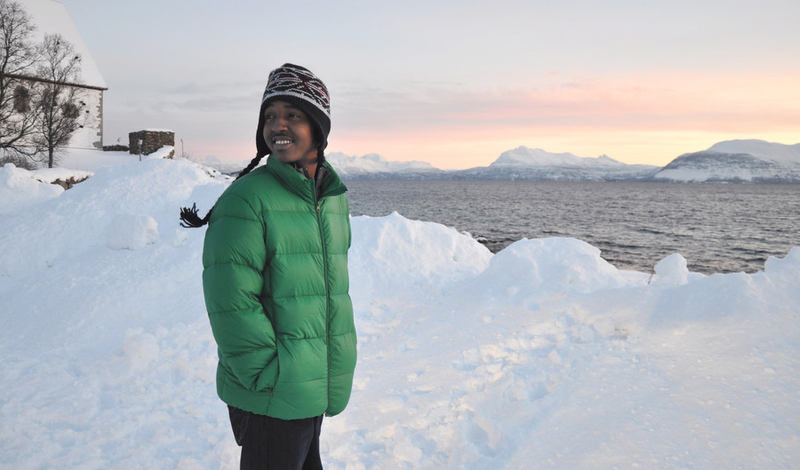 Before arriving in Norway, Ismail had seen snow only on TV. In Somalia, his idea of “chilly” was evening temperatures plunging to 64° F (18° C). It was also quite an adjustment to move to a place where the sun never sets in mid-summer, and never rises in mid-winter. But the biggest adjustment was cultural: moving from the familiar equatorial African culture in which he had grown up to the northernmost of northern European cultures. When he arrived in Harstad, its population of about 23,500 people included about 150 refugees, with perhaps a dozen Somalis in that number. In Norway as a whole, people of African descent account for less than 2% of the population. Yet for Ismail, it was all worth it to escape the fear, horror, and pain he had suffered because of Al-Shabaab. Just one year earlier, in 2010, Ismail (whose name was formerly spelled Ismael) was living in fear in Nairobi, Kenya, Somalia’s neighbor to the southwest, having escaped after a horrific experience at the hands of Al-Shabaab that took place in 2009. At that time Al-Shabaab, a group of militant Islamic extremists in Somalia, affiliated with Al Qaeda, was still in control of much of southern Somalia, including many sections of the capital, Mogadishu. And Ismail, who was only seventeen years old at the time, had done a very brave thing. Many of his friends from school were joining Al-Shabaab. Using a carrot-and-stick approach, Al-Shabaab promised cash, prepaid cellphones, and a martyr’s place in heaven to physically fit teenage boys if they joined, and threatened violence against them if they didn’t. Most boys who were approached in this way joined. He had seen how Al-Shabaab operated. And they had killed his uncle. “I can’t join anybody that killed my family,” he said. When they tried to recruit him, he told them he wanted to go to school instead. He knew the risks. And he paid dearly for his brave decision. A few days later, they came back and abducted him at gunpoint. Then, on June 26, 2009, after twenty-five days of captivity, they brought Ismail, along with three other young men who had also refused to join, to a crowded stadium (the locals were forced to attend or face reprisals). There, they performed on all four young men a brutal public “cross amputation”: cutting off the right hand and left foot. This was supposedly done as a punishment under Sharia law for fabricated charges of theft. But everyone knew that it was really being done as a public warning and example for anyone else who might consider resisting Al-Shabaab. After more time in captivity, the four young men managed to escape, taking a taxi (which had been called by a relative) to the Justice Ministry in Mogadishu, where they sought refuge. It was in the Somali government buildings that Ismail spoke with Michelle Shephard, a reporter for the Toronto Star. In the course of his interview with her, he begged her to take him back to Canada with her. Though she could not do that, there was one thing she could do: publish his story. The story in the Toronto Star inspired others to take up his cause. They were able to smuggle him out to Nairobi, where he began to seek asylum in Canada or any other distant country that would take him. Norway was the first to offer him asylum—perhaps because he had relatives already living in that country. And so, in the aftermath of his brutal maiming at the hands of political extremists, Ismail Khalif Abdulle found sanctuary half a world away, moving from near the Equator to north of the Arctic Circle in order to escape from terror and begin a new life free from fear. The effects of his earlier experience will always be with him, both in his spirit and in his body. But now he has a full measure of something he clung to during his long ordeal in Somalia: hope. The overcoming of suffering starts with hope. Al-Shabaab could not break Ismail’s spirit not only because he had courage, but also because he never let go of hope. Though we may think of hope as a vague feeling (“I hope things get better!”), if we dig deeper we find that effective hope is much more specific. Dimly hoping for things to get better usually doesn’t accomplish much. But hoping for things to get better in specific ways can be very powerful. At each stage of his ordeal, Ismail had specific hopes that led him to take specific actions. Once his ordeal began, his hopes led directly to the overcoming of his suffering. When Al-Shabaab first tried to recruit him, Ismail said “no” because he hoped for a better life than what the terrorist organization who murdered his uncle could offer him. He wanted to go to school and get an education. After Al-Shabaab captured and maimed him, he hoped for escape. This led him to look for opportunities to get away. Eventually the opportunity presented itself, and he did escape. After his escape, he hoped to gain safety and new opportunity by emigrating to a distant country where Al-Shabaab could no longer harm him. He expressed that hope to a Western reporter, which led to his gaining asylum in Norway. Though Al-Shabaab tried to destroy his early hopes of gaining an education and moving on to a better life, they could not break his spirit. In the midst of his suffering, Ismail maintained hope. It was not just a vague hope that things would get better. It was a clear hope for specific things that would make his life better in definite ways. Hope is not just an emotion or a feeling. Hope is a direction that we face. Yes, it is a positive attitude of mind. But more than that, it is a call to specific action based on increasingly clear beliefs about the kind of life we want to live compared to the life of pain, suffering, and struggle that we are experiencing in the moment. Ismail was a young man when this happened to him. He will experience other hardships, struggle, and suffering during the course of his life. Our hope for him is that wherever he is now, he will continue to have specific hopes that will carry him forward through each experience and every stage of his life. And our hope for you, dear reader, is the same. Yes, Annette and I were quite struck with what this young man went through, and yet his spirit was never broken. Unfortunately, it looks like we humans still have a lot of evil to wade through before these horrible acts become a thing of the past. But there’s still hope! And specific things we can do to bring humanity closer to that day. People like the man from Norway who was one of the attackers in the mall in Kenya hurt everyone, but they hurt people like Ismail Kalif Abdulle the worst because their exploits are used to increase anger and prejudice in those left behind. Yes, it is disheartening that criminal organizations such as Al-Shabaab have reached even to Norway to draw people into their destructive vision of reality. And as you say, the innocent do suffer the backlash. We cannot entirely escape evil. But we can keep working to overcome it.